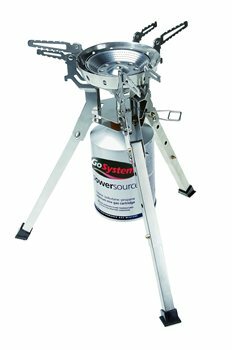 This stove is designed to provide a base camp, volume cooking facility and by size and power handle pots of more than 30cm diameter. It is fired by a directly attached GoSystem EN417 cartridge, and has Piezo Auto-Start ignition, with precision flame control & burner protecting windshield. The stainless steel and alloy telescopic legs are individually adjustable, ideal on uneven terrain, and fold up to create an easily transportable unit. Compact: w160 x d145 x h180mm.